María Bendito was born in Barcelona. After her Art History degree, she started the MA degree in Advanced Studies of Theory and Art History at the University of Barcelona and entered the Excellence Research Project ACAF/ART IV Cartografías críticas, analíticas y selectivas del entorno artístico y monumental del área mediterránea en la edad moderna. During that period, she obtained a grant at the University of Barcelona collaborated giving classes in both, the degree and MA degree, of the same university. She was also strengthening her professional career working as co-coordinator of exhibitions and activities of Arts Santa Mònica, a public institution for artistic development of Catalonia. She obtained the MA title in 2016 with a specialization in the art theory research line and the the thesis Mythical architecture. Case study of the Tower of Babel, which obtained excellence mark. 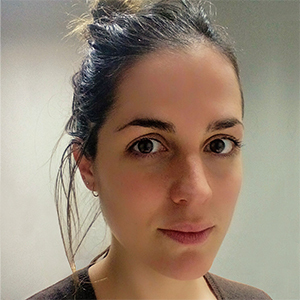 After de MA she entered the PhD program at the University of Barcelona and the second Excellence Research Project Art, Globalization, Interculturality. Critical Cartography of Art and Visuality in The Global Age: New Methodologies, Concepts, and Analytic Scopes. During 2017/2018 she combined the initial phase of the doctorate with professional experience working as Junior Registrar and coordinator of exhibitions at MACBA and has been the courier and responsible of its exhibition at Abu Dhabi in 2018. In July 2018 she received a national grant of 4 years to develop her doctoral research internationally with basement at the University of Barcelona. Her research, Representation, myth and metaphor of the Tower of Babel. From the linguistic forming of the collective identities to the technological identities of the globality, is focused on the conformation of national and digital identities in historical and global world. She continues collaborating with university courses in varied topics of Early Modern art as the course Michelangelo e la maniera romana, in the Art History degree, and the courses Research Perspectives and Methodological Tendencies and Art, Globalization and Multiculturality, both in the MA degree. She is the author of some articles about the dinamics of significances and transformation of art and its news approaches in the research journal ACTA ARTIS: Estudis d’Art Modern, numbers 4-5 and 6. She is the coordinator of issue number 7, which is exploring the continuities and ruptures of the trans-historical myth of the Tower of Babel. She has organized and coordinated congresses and seminars as the International Congress BABEL / GLOBAL, celebrated at the University of Barcelona in October 2018, and All things queer seminar with Juan Vicente Aliaga and Elisabeth Lebovici.